Excuses. Every Western Hockey League team has them. Travel. Injuries. No club is exempt from using an excuse when they fail to win a game. It is those that are able to deal with adversity, no matter in what form it comes, that are often destined for greatness. 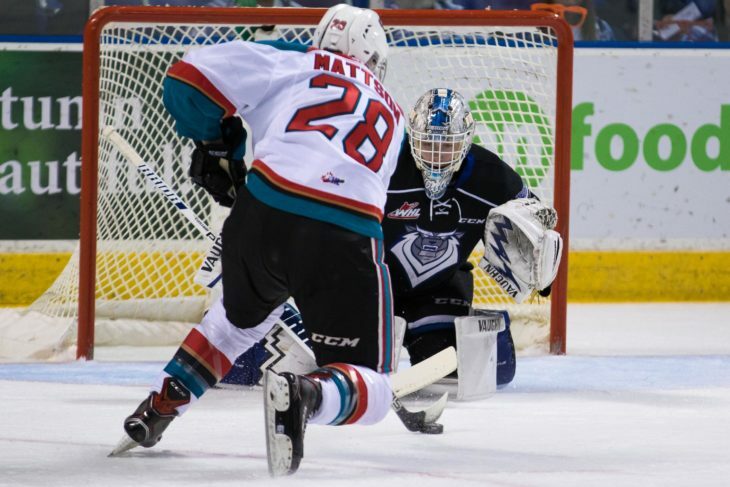 The Victoria Royals could have used the excuse last night that marquee goaltender Griffin Outhouse wasn't available and it was the main reason why they suffered a 8-2 loss at the hands of the visiting Kelowna Rockets. The Royals, who are off to a tremendous start this season with 8 wins in 10 games, were forced to send 16 year-old Brock Gould between the pipes against one of the lowest scoring teams in the Western Conference. Liam Kindree and Lassi Thomson each had four point games while the power play, which has resurrected from the dead, was a lethal force scoring on 4 of 6 chances. It was only the third win of the season for the Rockets, who also received goals from Nolan Foote (2), Erik Gardiner and Kaedan Korczak. All three wins this season have been on the road with victories in Prince George and Tri City. Let's call a spade a spade. Had Outhouse played, the season high 8 goal outburst likely wouldn't have been attained. But truthfully, the Rockets were the better team in several facets Friday night including a penalty killing unit which went 6 for 6. Heading into the weekend, the Royals owned the fourth best power play unit in the WHL. The Rockets had the second worst penalty killing unit. In Friday's game, it looked like the roles were reversed. While the Royals weren't using the excuse that their top player, Griffen Outhouse, wasn't in the lineup, the Rockets haven't played the excuse card either in the opening 11 games of the season. For those not paying attention, last night's win in Victoria was the first time this season the Rockets were able to dress three 20 year-old's. Lane Zablocki made his debut and made an immediate impact. Playing in a game for the first time since suiting up for the Royals against the Tri City Americans in the second round of last years playoffs, the overage forward was clearly noticeable. While sucking wind and pacing himself at times, Zablocki looked like the real deal. The Wetaskawin resident was involved physically, was being a thorn in the side of anyone wearing blue and talking the talk and walking the walk . I loved it. Zablocki earned an assist on a power play goal from Lassi Thomson and then picked up a helper on Kaedan Korczak's shot from the blue-line. A two point effort is all fine and good but his presence alone on the bench and on the ice can not be understated. I thought Kaedan Korczak was very good last night. Take away his goal if you want, his play in the defensive own zone was the best I've seen from him wearing Kelowna Rockets colours. Korczak was smart in his ability to defend by angling off opposing forwards and looking every bit a first round pick in next June's NHL draft. For Korczak to be considered a top 31 selection, he must bring that solid play to the ice more consistently. It may have been Nolan Foote's best game of the season. The about to turn 18 year-old made a wonderful play for his second goal of the game and showed off his quick release which would have been a handful even had Outhouse been in net. Foote now has 4 goals in 4 games. Foote is tied with Lassi Thomson with 6 goals, only two shy of team leader Leif Mattson who has 8. Kyle Topping isn't scoring many goals this season despite being third on the team in shots on goal. Failing to generate a shot on goal last night, the 19 year-old was able to collect two assists and is now riding a season high 6 game point streak. Often overlooked, Topping has been solid at the face-off circle winning 17 of 24 draws in last nights win. Leif Mattson deserves much credit for getting into a tilt with Royals forward Dino Kambeitz. The Rockets leading scorer does not fight. Ok, now he does. The 19 year-old did quite well. With 91 career points, the 100 point milestone isn't that far away. Had Mattson scored on a first period penalty shot, the Gordie Howe Hat trick would have been a reality. Roman Basran appears to have solidified the number one goaltending duties. The 17 year-old has started five straight games and six of the last seven. I had a chance to watch the post game video of Royals head coach Dan Price answering questions from what appears to be local reporters. The questioning is odd at best. Asking the coach about a rumour of veteran players been traded? Is that even a question for a coach after an 8-2 loss? Bad, bad timing and that is clearly not his department. That is clearly a question for GM Cam Hope. Suggesting that the Royals took the Rockets lightly? Was the reporter even watching the game? Price handled himself well considering the line of questioning. The two teams are back at it tonight in the rematch. The Rockets have failed to win back-to-back games since winning five in a row to close out the 2017-2018 season. We are on the air at 6 pm with 'The Kelowna Rockets This Week' where we hook up with former captain Tyler Spurgeon, who is playing hockey in Austria. I should also mention that we will have election coverage for you on AM 1150 during both intermissions and on our post game show. It is big day as Mayors and Councillors will be elected into office. Rockets d-man makes debut down south.